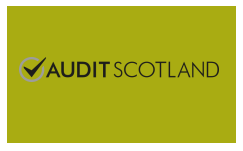 Audit Scotland was created to support both the Accounts Commission and the Auditor General for Scotland in carrying out their work. We help them ensure that organisations which spend public money in Scotland use it properly, efficiently and effectively. We do this by carrying out annual financial audits of Scotland’s public bodies, and by producing a wide range of reports on matters of public interest. These include overview reports on how different sectors perform, as well as reports on particular issues, either in an individual organisation or across a sector such as health or local government. These reports are considered in public by the Scottish Parliament and/or the Accounts Commission. Some audits are also undertaken by private firms. Who are the Auditor General for Scotland and the Accounts Commission for Scotland and what are their roles? The Auditor General for Scotland is Caroline Gardner, who has been in the post since July 2012. She is responsible for the audit of most public bodies in Scotland, except local authorities. This includes the Scottish Government and its departments, NHS boards and the police and fire institutions. Like Audit Scotland, the role of Auditor General is independent of government. She is appointed by the Queen on the recommendation of the Scottish Parliament. The Office of Auditor General for Scotland was created in 2000. The post can be held by an individual for a maximum of eight years. The Accounts Commission is the public spending watchdog for local government and its acting chair is Ronnie Hinds. It was established as a result of the 1973 Local Government Scotland Act and has up to 12 members appointed by Scottish Ministers. It holds councils in Scotland to account and helps them improve. The Controller of Audit reports directly to the Commission which operates impartially and independently of councils and of the Scottish Government. It meets and reports in public. These include the 1973 Local Government (Scotland) Act for the Accounts Commission, the 1998 Scotland Act which provided for the appointment of an independent Auditor General and the 2000 Public Finance and Accountability (Scotland) Act which set out the powers and responsibilities of Audit Scotland, the Auditor General and the Accounts Commission. Audit Scotland is held to account by Parliament through statutory arrangements put in place by the Scotland Act 1998 and through the Public Finance and Accountability (Scotland) Act 2000. 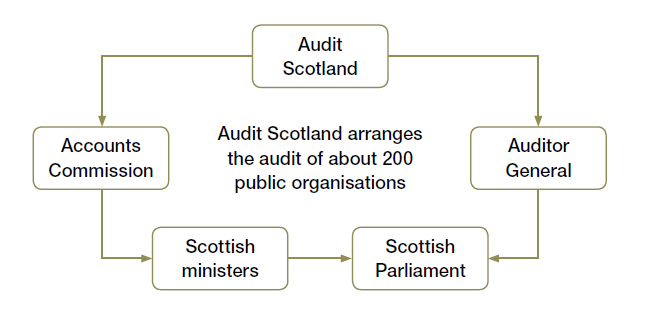 The Scottish Commission for Public Audit (SCPA) is central to these arrangements. The SCPA consists of five MSPs and meets in public. It appoints our non-executive board members and chair, scrutinises our budget, annual report and accounts, and produces reports on these. It appoints our external auditors, currently Alexander Sloan Chartered Accountants. Audit Scotland’s annual report and accounts are available on our website, together with all of our published audit reports including the recent Public Audit in Scotland report.